Developer Blair Williams’ Federal-Style Manse. Photo by Michael Horne. On October 26th, 1915, architect Armand Koch left his office in the Wells Building (which he designed in 1902) and headed to City Hall (which was designed by his father in 1895). The purpose of his visit was to take out a permit for a client who proposed to construct a substantial, 39-foot-by-39-foot, brick-veneered residence with 51,714 cubic feet of contents at the significant expense of $9,500. Most building permits of the time gave the first name of the owner in its entirety. This was not the case here, where the client was listed simply as “M. G. Ogden.” Most building permits of the time were issued to men. This was not the case here, where the client was Marion Gray Ogden (1875-1976), the granddaughter of pioneer John Ogden (1801-1891), who settled here in 1835. Whether the initials were to disguise the fact that the client was a woman is not known. The site of the home was at what was then 413-Lake Drive, south of the water tower. This area, today filled with fine homes, took years to develop, despite its proximity to the lake and the city, so this home was the first to be built on its site — no demolition required. Koch’s design is based on classic Federal principles utilizing fine proportions and symmetry. The central entrance is flanked on the first floor by two bay windows. Each bay has two windows above, while a small porch adorns the area above the entry. The southern parapet wall includes a chimney stack for the home’s two fireplaces. 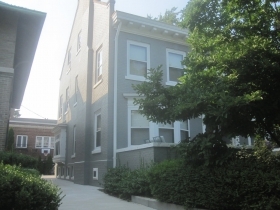 The home, with five bedrooms, three full and one half bath, sits a few steps above the street. It was equipped with two bathtubs, one shower, five wash basins, and a three-part laundry tub down in the basement. Rare for Milwaukee, the gable ends do not front the street, but are on the sides. The interior was substantially finished with coved ceilings and Red Gum paneling, more commonly found in homes in the south. All closets had built-in chests. Around the time of construction, Koch, who designed Grace Church, the Mother Church of the Wisconsin Evangelical Lutheran Synod and located on Broadway, was also busy with designing the Milwaukee Athletic Club further down that street. After the death of his wife in 1925, or possibly beforehand, George Whitfield Ogden lived with his daughter here until his death in 1930. Marion Ogden continued to live in the home for another quarter century. George Ogden was born in Milwaukee in 1844, the son of John Ogden, the pioneer. He took over his father’s carriage business, founded in 1849, and disbanded it in 1909 after the automobile made his trade obsolete. Ogden then engaged in real estate, developing the Hotel Wisconsin at the site of the carriage factory, now 720 N. Old World Third St. Today Ogden & Co. calls itself Wisconsin’s largest full service real estate company, with over 200 associates. George Ogden had a passion for history, especially of the bronze sort. As a member of the Old Settler’s Club, and among its two last survivors, he chaired the organization’s committee on monuments, and he took his job seriously. Some of the tablets which were erected in Milwaukee through Mr. Ogden’s efforts are the marker on the promontory at Mitchell park, marking the site of the home of Jacques Vieau, early Milwaukee fur trader; that at 225 Thirteenth st., where Abraham Lincoln addressed the Wisconsin State Fair in 1859; that on the west side of the First Wisconsin National Bank building, [sic. Should be Pabst Building. –Ed.] site of the birthplace of Charles Milwaukee Sivyer, first Milwaukee white boy, and those marking the first court house, the first county jail, the first home on the east side, and the tablet in memory of Increase Allen Lapham, naturalist, in Lapham park. His daughter took up his historical mission, being one of the organizers of the Milwaukee County Historical Society in 1935, and active as secretary and in other positions until her death forty years later. She was also interested in the welfare of youth, and helped to organize the Boys Club here. In 1901, she served in an unpaid position as the county’s first juvenile probation agent. In 1945 Miss Ogden wrote a slim volume of 34 pages entitled “The Homes of Old Spring Street.” It may have been the first book devoted to lost Milwaukee buildings. Her father was born on the street, now W. Wisconsin Ave., and lived in a cottage there between what was then 2nd and 3rd streets. By the time of the writing, many of the street’s fine homes had been torn down to accommodate the growth of Downtown. In 1938, one such threatened structure, an 1840s Greek Revival home built and occupied by Benjamin Church, was moved to Estabrook Park, where it remains, thanks to the efforts of the historical society. 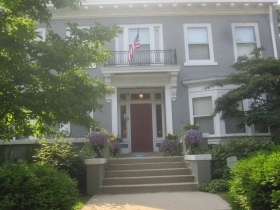 (The home is open for tours Sundays from 12 to 4 during June-September, and is filled with period pieces, some donated by the Ogden family.) A few homes, like the Alexander Mitchell home, now the Wisconsin Club, remained, but most were lost. Miss Ogden researched the neighborhood quite thoroughly, yet left several blank pages in the book for “Notes,” in the event the reader cared to expand on her research. Miss Ogden noted the cottages, the mansions and even the stables of the old neighborhood where her father was born. As the daughter and granddaughter of carriage makers, she noted the inventory of one old stable. “1868 — Piano Box Buggy — $300, Turn-seat Rock-away — $450. 1873 — Platform Chariotte – $750. And these prices included no motor-power,” she added. Those were some valuable buggies. The home built for Marian Ogden was 45 years old when it first came on the market in 1960. 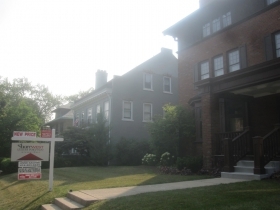 Ogden & Co. listed the home with an asking price of $22,900, selling it for $21,000 to Ward Schram, who updated the electrical system and added the retaining wall in front of the home. On the last day of 1965, Schram sold the home to Joseph R. Palmatier for $32,000. In 1971 it was advertised for sale. “Outside vestibule, Butler’s Pantry and covered patio. All closets have built-in chests. Plastered attic with storage cabinets. Exclude Basketball Hoop,” wrote the real estate agent. John Lorbecki bought it for $44,900 in early 1972. 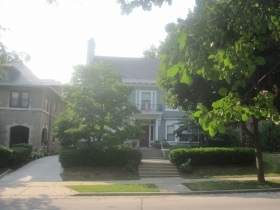 In 1986 Lorbecki sold the home for $115,000 to John and Mary Moss, who operated the place as the Ogden House Bed & Breakfast, after converting the attic to a master suite. Robert E. Monley later owned the house, offering it for sale in 1999. The subject is located on a visually appealing block on Milwaukee’s popular east side. Functional obsolescence. 1.) Low headroom in powder room (6′) 2.) No garage. 3.) The painted aspect of the brick veneer increases the cost of upkeep. Good condition throughout. LR Refinished quarter-sawn oak floor, coved ceiling, bay window, quarry brick natural fireplace with glass door. DR Quarter-sawn oak floor, bay window with seat, beamed ceiling, china buffet and cabinets and drawer cases, 2 leaded glass windows, wainscoting to 5′ topped with a plate rail and leaded glass French doors to stair hall. Schley figured the home was worth $334,000. On February 2nd, 1999, the Ostermeyers bought it for $326,000, selling it to the current owners, Blair W. Williams and his wife Stacy Williams, for $500,000 in 2003. Its bed-and-breakfast days were over. Today the home is one of the many ornaments of N. Lake Drive and the Northpoint neighborhood, known for fine homes and a bewildering variety of domestic architecture ranging from traditional homes like this one to Frank Lloyd Wright‘s Bogk House, built two years after this one, and decidedly non-traditional, save for the symmetry of its facade. [See House Confidential: An Extraordinary Frank Lloyd Wright.] 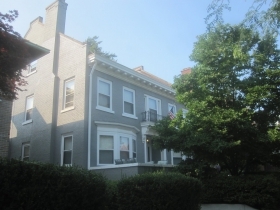 The brick home is painted gray, with white trim. The small front garden is attractively planted, and flower pots adorn the porch. 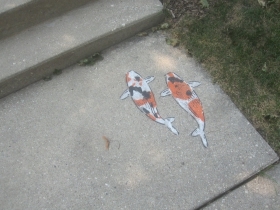 The walk to the home includes a Koi stencil by Jeremy Novy, a recent touch. An American flag flies from the porch above the front door, which is painted scarlet. The hedges could use a pruning. ‘Twas on your broad and sheltered way / Men built their homes in an early day. For peaceful life on a quiet street. Description: Rare for Milwaukee, the gable ends do not face the street on this refined, restrained and symmetrical residence. Was, for a number of years, a Bed and Breakfast in a single family home. Has since reverted to its original use. Walk Score: 91 out of 100 “Walker’s Paradise” Daily errands do not require a car. City of Milwaukee Average: 62 out of 100.